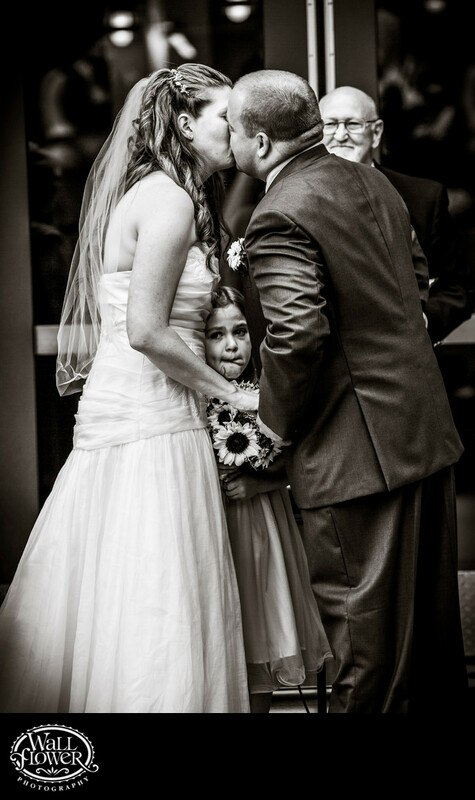 The story behind this award-winning capture is that this flower girl is the bride's daughter, who got progressively emotional during the wedding ceremony, and had squeezed her way into the middle by the time we got to the first kiss. She isn't sticking her tongue out at me or anyone in particular; she's licking tears off her face! The black and white effect gives the photo a classic feel free of the distraction of color. This photo won 2nd place in a wedding photography competition held by the Artistic Guild of the Wedding Photojournalist Association (AG|WPJA). The ceremony took place at the base of the concrete amphitheater bowl at the Washington State History Museum (WSHM) in Tacoma, Washington.